Cyfiau Bach is a converted stone barn which offers lovely self catering accommodation. 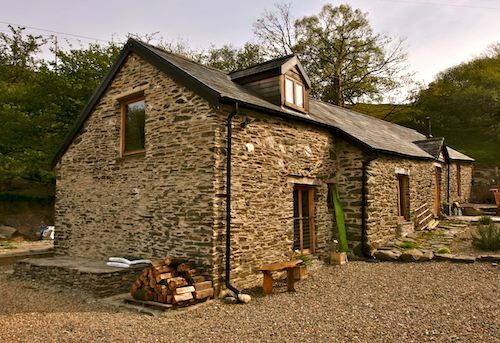 The barn sits in a peaceful and secluded spot on the outskirts of Devils Bridge, a short drive from Aberystwyth. 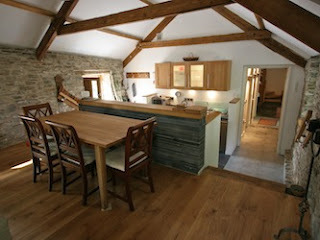 This barn can sleep up to 6 people in 3 en suite bedrooms. The interior is on several levels and comes with exposed beams and stone walls. The large lounge/diner has a wood burning stove. Facilities include a 32" LCD television & DVD player. Outside there is seating for dining on the terraced front garden. A large decked area is also to the rear of the property. Delightful views of mountains can be enjoyed from here. The narrow gauge steam railway, famous waterfalls, The Hafod Arms Hotel and village shops are only a walk away. Lots of great days out are nearby, and the area is a haven for outdoor activities.